We don’t know how it is with you, but we love rustic things a lot. 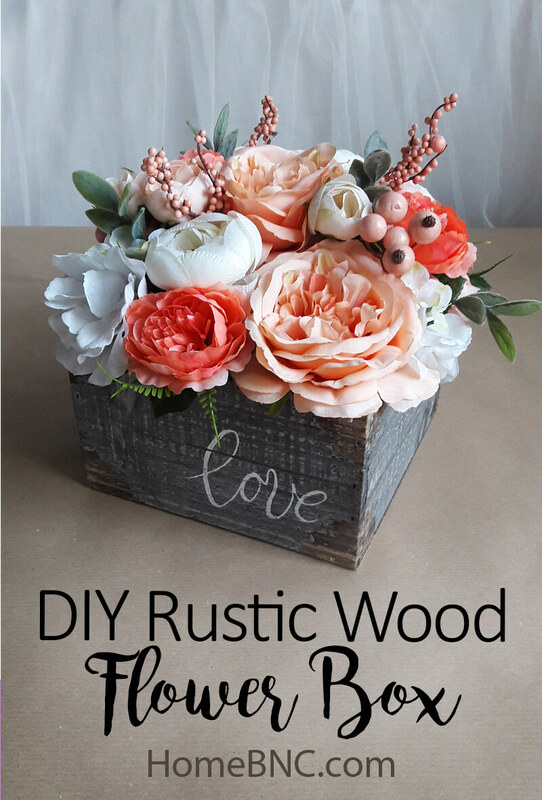 The word rustic doesn’t mean something dated or old-fashioned anymore. In fact it means quite the opposite. By applying the appropriate tricks and accessories we can create something really fashionable. These objects do create a snug, romantic atmosphere. To prove this, we have made a silk flower composition. 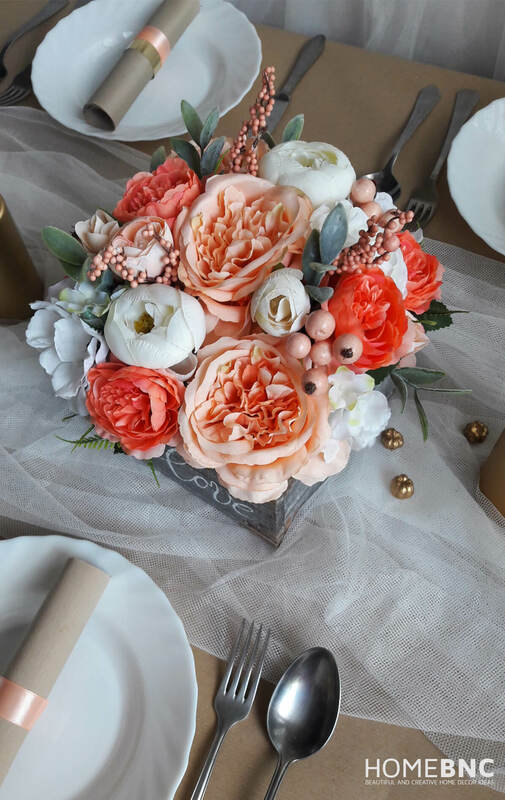 The shades of orange flowers make it an excellent decoration for spring, summer or autumn. 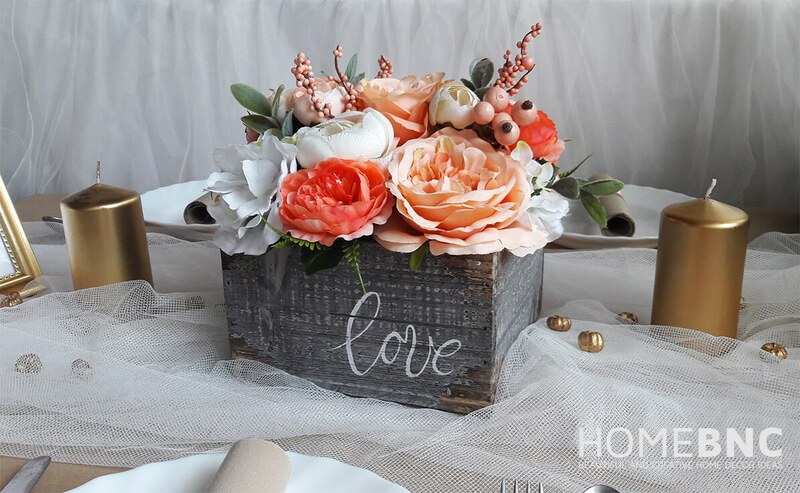 We put the flowers into a rustic wood box and added a hand-painted text to make it even more unique and personal. 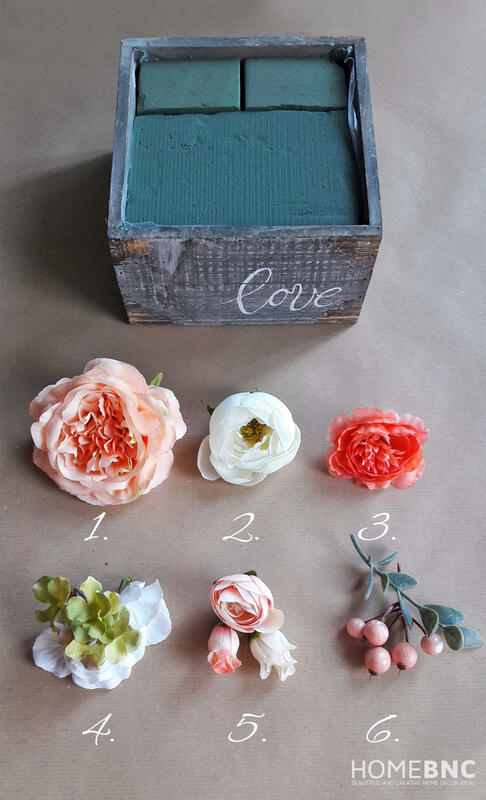 You can decorate any part of your apartment with it and it might even make a fancy wedding decoration. We enjoyed doing it a lot and now that it’s done we really do take pleasure in it. We hope you will have as much fun with it as we did. 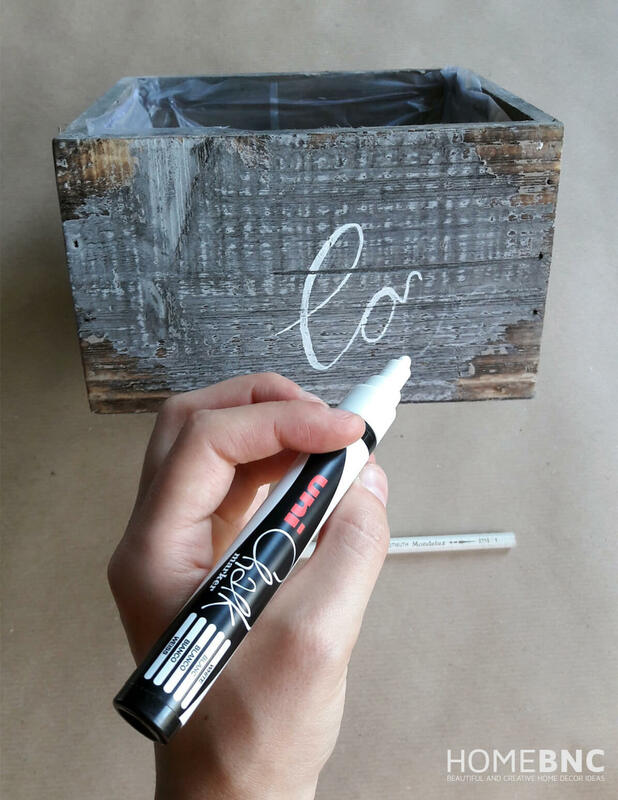 Before you start putting the flower composition together, take the chalk marker and paint the word “love” (or any other word of your liking) on the side of the box. It’s not necessary to let it dry, so you can move on to the next step right away. First, you will have to cut the foam to fit into the wood box (our box is 7”×7”). 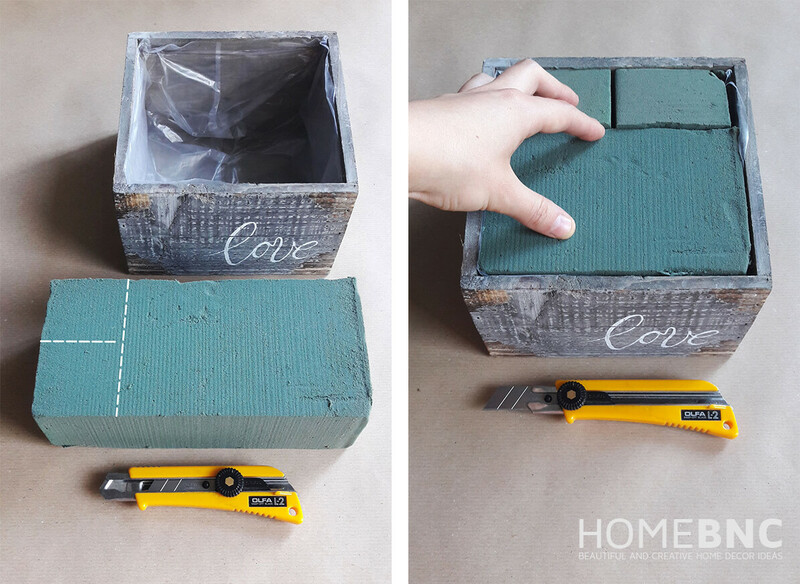 Place the blocks into the box. You may want to start with the largest one and then fill the remaining space with the two smaller ones. 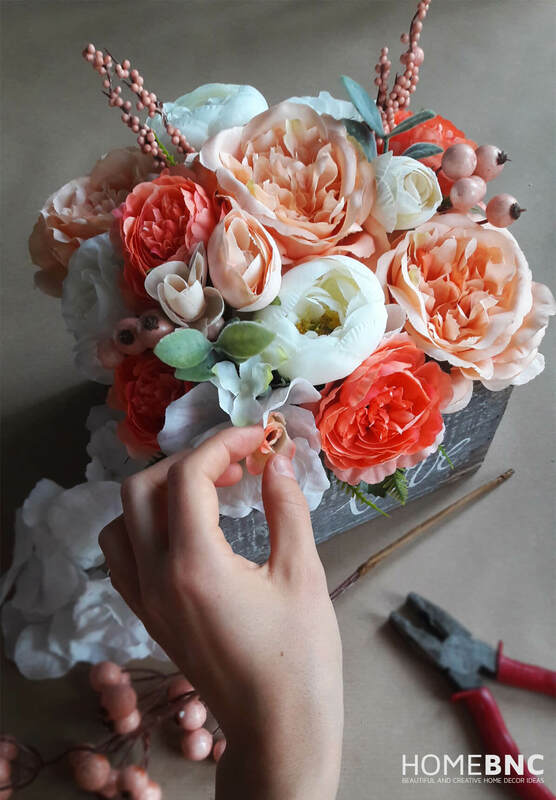 Place the flower with the largest head into the foam diagonally. After that, put two white flowers next to the peach-coloured one. Next place two of the coral-coloured flower (Nr. 3 in the picture) around the larger ones, then fill the remaining space with the flowers marked Nr 2 and 3 in the picture. 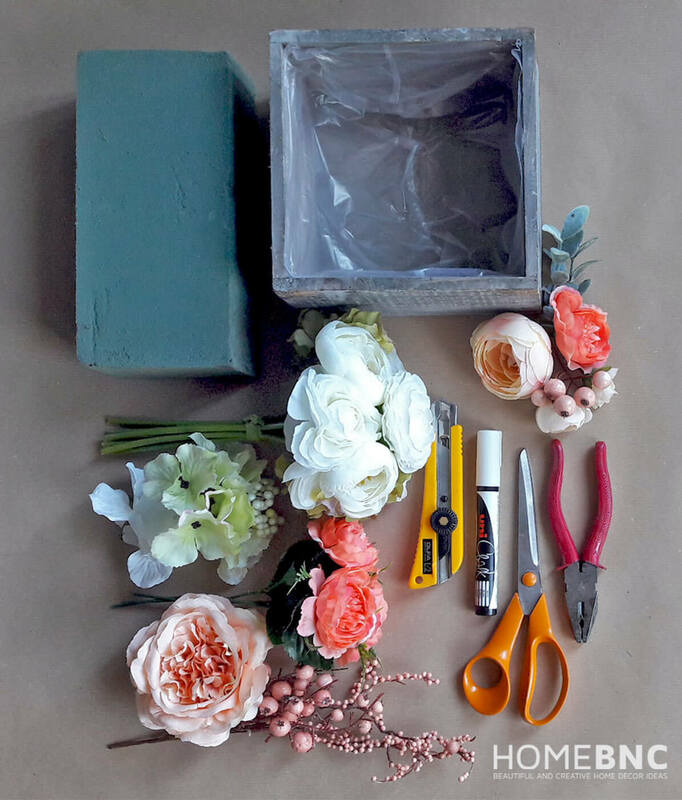 To finish off, fill the spaces with the remaining small-headed flowers, berries and greens to add some depth to the composition. This stylish decoration will suit to whatever summer or autumn feast you can think of. In the picture it is used as a wedding decoration. Get inspired and have fun!